H.R.H. prince Charles is patron to several organizations that are active in Romania. These have been been responsible for substantial restoration work in Transylvania principally in the vicinity of Sighisoara, a UNESCO designated Heritage City. Several villages have benefited from restoration work coordination most notably Malencrav and Viscri. More recently he has been hosted in Archita, Transylvania, by the Maria Nobrega Foundation. It has funded restoration of several; buildings in the village and one -the von Sternberg House – has been donated to the prince has an administrative home to his Transylvanian activities. The prince is also Patron of INTBAU (International network for Traditional Building, Architecture, and Urbanism) which is prominent internationally for its advocacy of restoration and new building that respects cultural tradition and identity. Dimancescu is a friend member of INTBAU. INTBAU is currently involved in two projects in Romania. One is focused on assisting the Mayor and Council of Bran to plan for the protection of undeveloped natural zones within the Commune’s boundaries. The second is planning assistance for the Commune of Laslea (near Sighisoara) in developing its appeal to tourists. INTBAU supported recent efforts to reconsider plans for the construction of a Mall in historic Sibiu/Hermannstadt designated Cultural Capital of Europe 2007. A frequent visitor to Romania, HRH has traveled to various parts of the country. Prince Charles, the heir to the British throne, made on Tuesday a short private visit in the village of Miclosoara, Covasna County, following an invitation from landowner Kalnoky Tibor. Prince Charles took an approximately two-hour walk on the village streets where he talked with locals and government representatives. Nagy Istvan, the mayor of Baraolt, which has in its jurisdiction the village of Miclosoara, said yesterday that Prince Charles’ visit was a surprise to him. “Prince Charles talked to current and former local councilors and was especially interested in the Szecklers’ traditions. He knew a lot about the Hungarian community but he did not know about the Szeckler one. I talked to him for about ten or fifteen minutes. We talked about the town, abut the poor state of the roads, although it seems he is already familiar with the roads in Romania,” Nagy said. Additionally, the prince asked the mayor of Baraolt if the locals are skeptical regarding accession to the European Union. “He wanted to know whether there was any euro-skepticism among the locals and I said there wasn’t because we, Hungarians, are on Europe’s side and we want to join the union as soon as possible,” Nagy Istvan said. 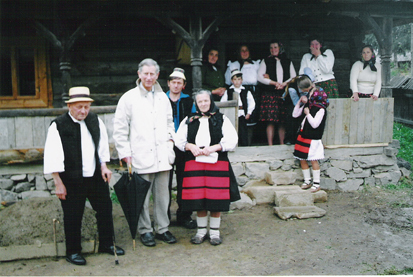 Prince Charles visited Miclosoara village accompanied by two friends, entered the house of a local where he was welcomed with traditional bread and palinca, a traditional plum brandy. Before enjoying the food, however, he wanted to know what agricultural tools the locals use, and took great interest in the horse wagon in the respective household. Prince Charles also talked for a few minutes with the president of the Covasna local council, who gave him an album of old music and invited him to pay more visits to the county. 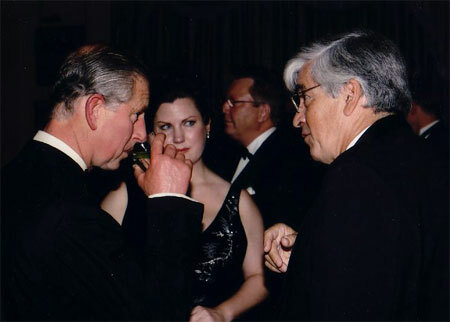 HRH Prince Charles, Christine Franck, and Dan Dimancescu at Clarence House, London, for a dinner he hosted for supporters of INTBAU.